Like Chess, purchasing international business class travel has become a game. Airlines play against travelers and both have the same objective of achieving maximum value. Travelers are always looking for the next hot deal, while airlines attempt to sell their seats at the highest possible price. “Hot deals” occur when carriers overestimate the fare level travelers are willing to pay and are forced to slash fares to avoid empty planes. Passport Premiere assists members in determining if fare premiums are supported by legitimate demand or speculation. When higher than expected fare levels are only available despite the carrier having a significant number of unsold seats, the odds are in your favor that fares will correct at a future date. Passport Premiere keeps members “in the game” by capturing short term downward fare moves when fare change happens. A common misconception is that buying early is the key to securing the lowest business class fare levels. The current trend is for carriers to set higher than expected prices months in advance of a flight’s departure with the hopes that travelers will bid pricing higher. Fare are no longer fixed and are distributed by auction. Minimum fare levels are initially created by carriers, but a shortage of price insensitive buyers can cause fare levels to crash as the departure date approaches. 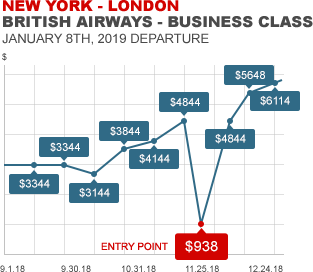 As many business class fares are non-refundable, purchasing too early makes the carrier the winner and keeps you from executing lower price levels when fare change happens. Fares are not regulated in the U.S. and are not law. A fare is nothing more than an agreement between a passenger and a carrier to provide transportation at a specified price. When demand surges, fares are bid upward. When fares surge based speculation rather than genuine demand, pricing corrects. We recognize that international business and first class travel is a significant financial commitment. Like other commitments, you wouldn’t purchase a home without first finding out what other properties in the neighborhood sold for last week, last month and last year. You likely wouldn’t buy a stock that’s in a free fall. Premium class air travel should be no different. As a Premiere member, you will be able to sharpen the timing of your premium class travel purchases which can ultimately save you thousands. We look forward to welcoming you to Passport Premiere!